There are minimum credit score requirements to qualify for a residential mortgage loan. One or two late payments in the past 12 months is not a deal killer. Multiple late payments will be an issue. 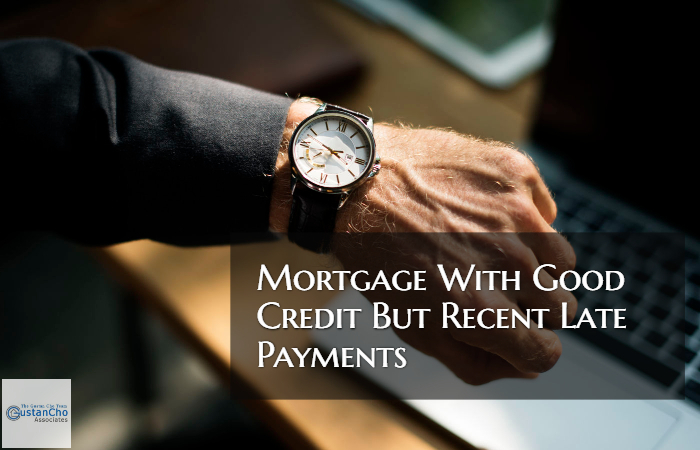 Although the above are mandatory minimum credit scores for the particular mortgage loan programs, all mortgage lenders will review the overall credit history of the borrower. A recent late payment that is reported on the credit report is any late credit payment that is 30 days old. The chances of getting a mortgage loan approval with a bank with late payments in the past 12 months will be very slim. There are potential solutions in taking steps in trying to get the recent late payment removed from credit report. Borrowers history of paying bills on time and have multiple late payment history on credit report but have decent credit scores may encounter problems in getting automated AUS Approval. The Gustan Cho Team does not have any mortgage overlays on government and conventional loans. Borrowers can qualify for a mortgage with good credit but recent late payments with an AUS Approval. All manual underwriting requires timely payments in the past 12 months. Please contact us at 262-716-8151 or text us for faster response if trying to qualify for mortgage with good credit but recent late payments. Or email us at gcho@loancabin.com. RELATED> What happens if I skip a mortgage payment? RELATED> How to get a FHA Loan? RELATED> Can I qualify for mortgage with recent late payment? i don’t usually buy into this idea until i gave it a trial. All of my life my credit profile was in poor condition until I was introduced to Dale Elenteny of Gustan Cho Associates at Loan Cabin Inc. I have a lot of problems with the creditor ,i have been deprive of many things i needed to do, i almost ran into bankruptcy i have lost a lot ,untiL i came across Dale Elenteny and Bianca Piverger at http://www.homesnetwork.org. Both Bianca Piverger and Dale Elenteny helped me fixed my credit profile in days he increased my score from 435 to 755 and also remove all negative items from my report . Now i’m able to get my personal home for myself and my family . My credit profile is now perfect just as i wished ,if you have similar problems get to him on above. I want to thank the whole team at Gustan Cho Associates at Loan Cabin Inc. for giving me the best Christmas ever.